This cupola sits atop the Administration Section of the Babcock Building, completed in 1885, at the former South Carolina Lunatic Asylum in Columbia. The section of the building contained patient dining areas, operating rooms and housing for nurses and doctor's. Hallway bath inside the Babcock Building at the South Carolina Lunatic Asylum, abandoned in the 1990's. The administration section of the Babcock Building at the South Carolina Lunatic Asylum was the last section of the building to be constructed and was completed in 1885. Within the central building was a central hall, with offices on either side, and a connector hallway to allow for passage from between the north and south wards. 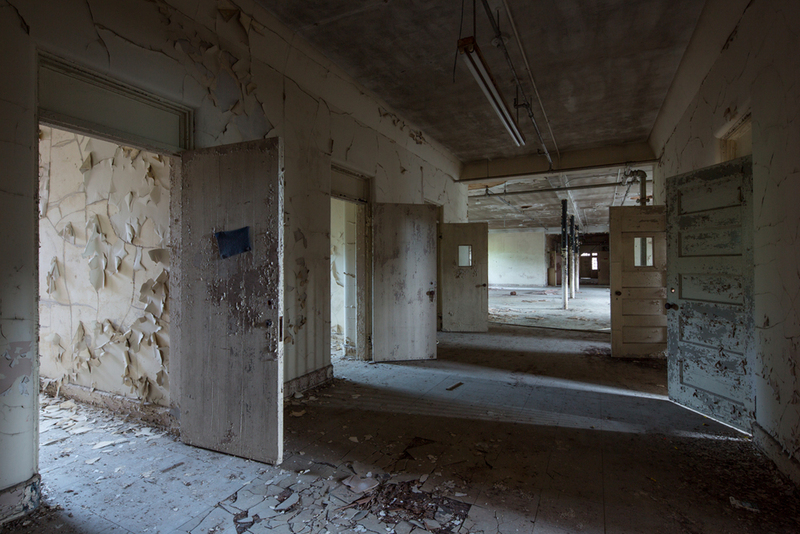 The second floor contained operating rooms as well as residences for the doctors and supervisor. Development on the Bull Street Village in South Carolina, which is the area containing the old South Carolina Lunatic Asylum, might begin as early as fall, but construction is expected to last for two decades. Plans include the addition of new homes, stores and offices as well as a baseball field. The Babcock Building, shown here, will be converted into a conference hotel. 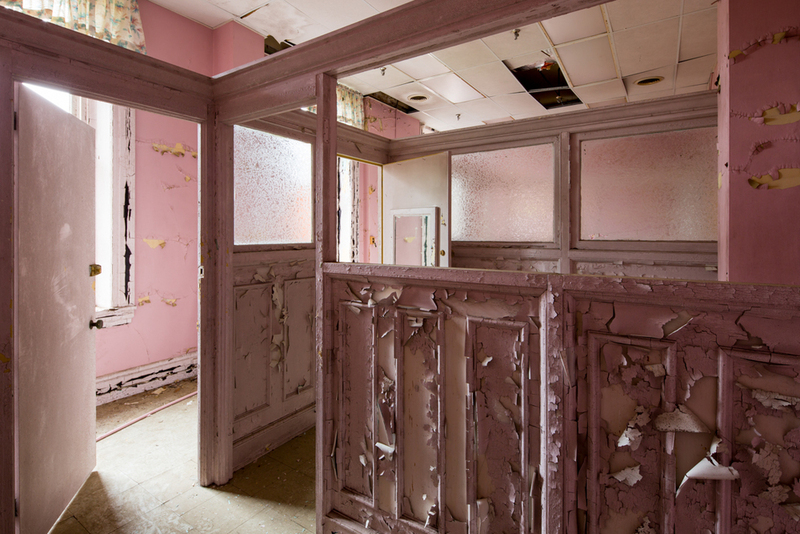 Much work will need to be done to make the structure of the Babcock safe again, as there are a number of areas on the ward floors that are in a similar condition as the flooring shown here. Portions are fully collapsed, giving a peek of the floors below. Class room door. Administration Building, Babcock Building at South Carolina Lunatic Asylum. Construction of the Babcock Building at the South Carolina Lunatic Asylum took nearly 7 years and the building was constructed in 4 phases by 3 architects. The building accepted its first patient in 1885. It's natural to get stuck in a routine, to be so comfortable with something that change becomes frightening, but I truly believe that every ended opportunity leads to another open door full of possibilities. It's not often what we expect, and sometimes not what we think we want, but sometimes it's the best thing for us. For many, it's hard to comprehend how someone could feel at peace inside an abandoned location, especially an asylum. 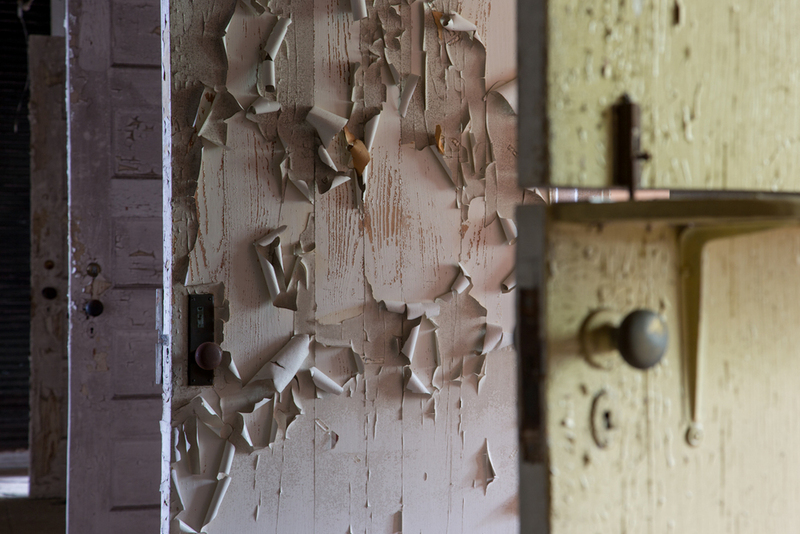 Though many of these places were saturated with dispair, loneliness and depression, where patients were sometimes mistreated, asylums are also a major part of America's history that should not be forgotten. The serenity I find inside these places comes from the lessons we as humans have learned about care for the mentally ill, from the stories of those who were patients or staff that the images help tell, from the incredible architecture and the beauty in having an opportunity to document something that will soon be lost forever. Photo: "The Only Way To Survive"
Vines creep towards the light in the tunnels of the Babcock Building at the South Carolina Lunatic Asylum, constructed in the late 1800's. The Babcock Building at the South Carolina Lunatic Asylum was constructed in the Italian Renaissance Revival style and the footprint resembled a Kirkbride. The building was built in four phases spanning nearly 30 years. The Administration Section, shown here, was among the last sections to be built. Patient room door inside a dark corridor of the Babcock Building at the former South Carolina Lunatic Asylum. Much of this wing is in decent shape, but this particular restroom experienced years of decay and finally gave in. The ceiling was crumbling and the floor was collapsing between the beams. It was beautiful. Patient mattresses piled in a day room of the Babcock Building at the South Carolina Lunatic Asylum.